Apple today released iOS 8.1.2 to the public, introducing bug fixes and addressing an issue that caused ringtones purchased through the iTunes Store to be removed from an iOS device. Apple advises users who have lost ringtones to restore them by visiting itunes.com/restore-tones from their iOS devices. iOS 8.1.2, carrying a build number of 12B440, was not seeded to developers before being released to the public. The software is available immediately as an over-the-air-download. 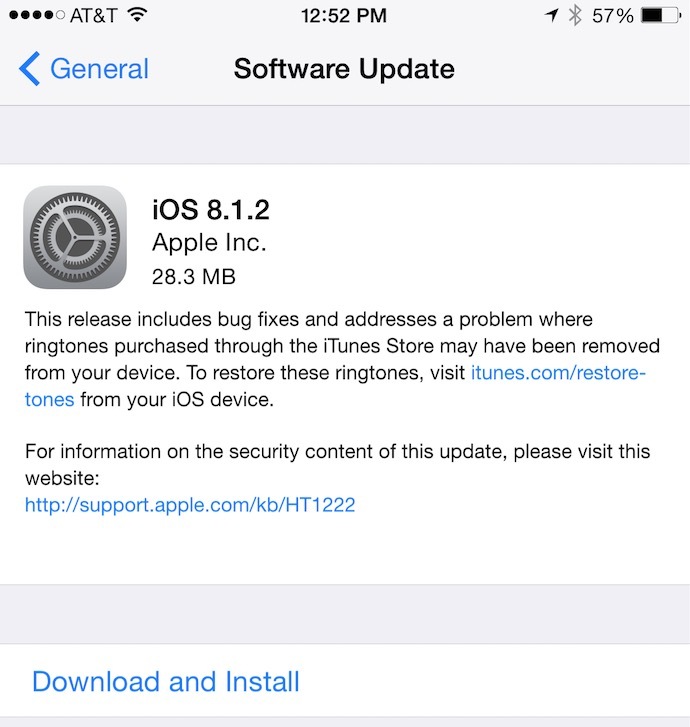 Like iOS 8.1.1, released on November 17, iOS 8.1.2 is a minor update that focuses solely on bug fixes. It does not bundle in any of the major new features that are rumored for iOS 8, like improvements to Maps and split-screen multitasking for the iPad. Apple is also working on iOS 8.2 with the WatchKit SDK, which was seeded to developers in mid-November. You know what's sad? I used to love software updates. I was one of those people who upgraded everything the second it was released for years. Today, however, with Apple's lately buggy offerings and bad updates (like the recent Safari updated and iOS 8.0.1) I now wait a while. How things have changed...it just doesn't work. Incoming complaints about how this update doesn't solve user error. Too bad they have to increment the entire OS one version number for a single, small fix. That's what x.x.x updates are for. Geez. And they would have gotten away with it too, if it wasn't for this meddlin' fix! I've never even heard about this issues and I hang around Apple-related forums and websites quite a bit. However, I and many others have a ridiculously long laundry list of iOS 8 bugs that haven't even been addressed. How about all the crashing? My 6 Plus many times can't even switch from one Safari tab to the next without the last one reloading when you go back. I don't even remember my original iPhone with 128MB of RAM being that bad. Furthermore there are tons of other glitches, like white text overlaying the black status bar text sometimes, rotating video glitches on the Plus, problems with reachability not activating (sometimes it just stops for several minutes and then works fine), or reachability not even working with quick reply which means I can't reach the send button, or the Touch ID dialog screen sometimes freezes up the phone with a dark overlay that makes it impossible to touch anything, or iCloud Photo Library that has never worked, or the shoddy WiFi issues on the Air 2, or problems with slow-mo videos sometimes not recording in slow-mo, or that my share sheets sometimes still lose the order I've set the icons to, and several other things that I can't even recall at the moment. My iPhone 5 on iOS 7 was much better (software-wise) than my iPhone 6 Plus on iOS 8. Otherwise the 6 Plus has a gorgeous display, amazing camera, and looks really great. How about a major update that fixes most of the issues, please. It's terrible that Apple are releasing these updates to fix issues. No software is perfect.